Lionfish Hanging Earrings hand crafted in Curacao by Lionfish Caribbean. 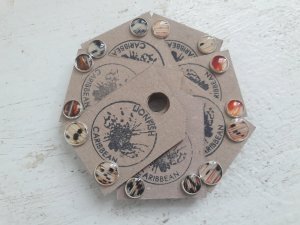 Made from the non-venomous spines and stainless steel/zinc alloy these unique..
Lionfish Stud Earrings hand crafted in Curacao by Lionfish Caribbean. Made from the non-venomous spines and stainless steel these unique lionfish stud..
Lionfish pendant necklace with chain included, hand made in Curacao by Lionfish Caribbean. Made from the non-venomous spines these unique 1 inch diame..
Lionfish pendant bracelet hand made in Curacao by Lionfish Caribbean. Made from the non-venomous spines and stainless steel/zinc alloy (nickel free) t..
Lionfish Ring hand made in Curacao by Lionfish Caribbean. 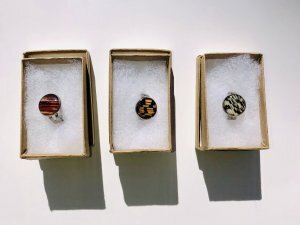 Made from the non-venomous spines and adjustable zinc alloy these unique lionfish rings are ..
Lionfish Cuff Links hand made in Curacao by Lionfish Caribbean. Made from the non-venomous spines and silver plated stainless steel, these stunning cu..
Lionfish Key Chain Bottle Opener hand made in Curacao by Lionfish Caribbean. 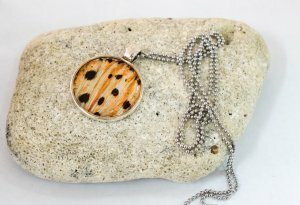 Made from the non-venomous spines, the beautiful gift items are available..